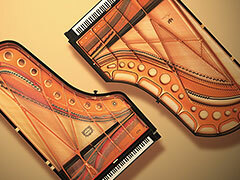 "Real Grand Expression" Sound, touch, pedals-perfectly integrated to give you the sensation of playing a grand piano. The CFX-Yamaha's finest concert grand selected and played by the winner of the 2010 International Chopin Piano Competition-and the Imperial from Bösendorfer-a brand held in high esteem by pianists throughout its long history-are renowned pianos characterized by distinctive traits such as power, versatility, subtlety, lightness and mellowness. With your Clavinova, you can enjoy the exquisite beauty of the sought-after tone that the CFX and Bösendorfer Imperial deliver. The Clavinova faithfully reproduces the sound of an acoustic piano utilizing features like String Resonance to emulate the mellow tonal color that occurs when strings react to one another. The result is a beautiful tone with rich, deep reverberation. In addition to the reverberation of the strings themselves, Damper Resonance reproduces the broad, deep sound field of an acoustic piano. It also mirrors the tonal changes that result when a damper pedal on a grand piano is depressed. It includes sounds such as those emitted from the key bed and emulates the cumulative resonance that occurs when all of these sounds blend together. 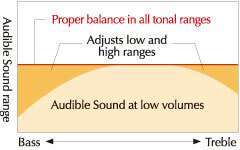 Pianists can change the volume of the sound-as well as its dynamics-to achieve both mellow and bright tones by simply changing the pressure they apply to the keys. Featuring Yamaha Smooth Release technology, Clavinova offers the crisp tone heard when playing staccato as well as the lingering sound produced by releasing the keys more. This provides finely-nuanced response to the pianist's playing. The moment a pianist's fingers are lifted from the keys of a grand piano, subtle changes occur in the instrument's tone as the damper is lowered onto the strings to mute its sound. Key-Off samples features actual recordings of these changes, offering a faithful reproduction of the most subtle changes in the piano's sound, allowing for a more realistic performance. Utilizing the same hammering system and spring-less mechanism as a grand piano, the GH3X keyboard action accurately reproduces the touch of an acoustic piano from the heavy feel in the lower register to the lighter touch in the upper octaves. They also feature the three-sensor configuration, which accurately sense and interpret the behavior of the keyboard for a response and feel very similar to that of a grand piano. The newly developed GH3X keyboards also feature an escapement mechanism that reproduces a slight clicking sensation near the bottom of the key dip, and they have been designed in such a way that the click is discernible only on the lightest keystrokes, similar to the keyboard of a grand piano. The body of the Clavinova contains Acoustic Optimizers that regulate the flow of sound and control tone. A new technology springing from Yamaha's intimate knowledge of the acoustic properties of the interiors of musical instruments, Acoustic Optimizers deliver natural, smooth feel and tone across the entire keyboard. Record performances to USB flash memory and create audio files (WAV format) you can save and play back on a computer, share with friends or create a CD. In addition to its world-class grand pianos, the Clavinova CLP Series boast a library of impressive Voices including, electric pianos and a variety of organs. Enjoy the freedom to choose the ideal Voice for the genre of music you want to play. The new reverbs allow to you enjoy the sensation of playing a piano recital in a large concert hall, or experience the ethereal, moving sound of a pipe organ played in a cathedral. The Clavinova Series allow you to incorporate these exquisite reverbs to add depth and atmosphere to your sound and enjoy concert hall ambience and spaciousness in the privacy of your own home.